Many Americans enjoy an alcoholic beverage or two once in a while. But according to the Centers for Disease Control and Prevention, more than 38 million people engage in binge drinking at least four times a month. Binge drinking equates to about five alcoholic beverages in a short amount of time for men and at least four for women. This is a serious problem in the United States, costing about 223.5 billion dollars as reported for 2006. It’s also costing lives--about 80,000 people die every year due to binge drinking. 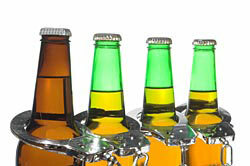 Binge drinking poses a serious health risk to the person and others around them. For example, a person who binge drinks is more likely to get hurt or seriously injure or kill someone in an automobile accident. Violence and suicides also increase for people who binge drink. The CDC has also found that most people involved in DUI investigations had been binge drinking. In addition to these serious problems, binge drinking can also result in the spread of sexually transmitted diseases, such as HIV. It can also lead to unplanned pregnancies, sudden infant death syndrome and alcohol dependency issues. The CDC also conducted research to determine which groups of people were at the highest risk for binge drinking. Males age 18-34 had the highest amount of binge drinkers while males over the age of 65 had the highest amount of binge drinking episodes. In terms of income levels, binge drinkers who made more than $75,000 a year had the most binge drinkers whereas those with yearly salaries less than $25,000 consumed the most drinks per binge and did this most often. While binge drinking varies by state, the Behavioral Risk Factor Surveillance System discovered that binge drinking occurs the most in the Midwest, New England, Hawaii, Alaska and the District of Columbia. Utah had the lowest occurrences at 10.9% of the adult population, while Wisconsin had the most at 25.6%. These statistics are alarming and it’s evident that states, communities and individuals need to band together to prevent binge drinking. Increasing awareness and promoting drinking in moderation are the first steps towards reducing the occurrences of binge drinking.